1. Cupcake decorating is not really my thing (although I SO want it to be. Someone, teach me!). 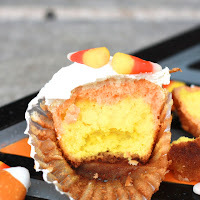 Last Halloween I found ways to make cupcakes look adorable without having to pipe any frosting on. Exhibit A (Candy Corn Sugar Cookie Cupcakes) and Exhibit B (Chocolate Cupcakes with Ganache Filling and Buttercream Frosting) below. 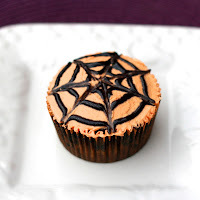 If you only have time for one between now and Halloween, go for the chocolate....INCREDIBLE! 2. My friend Laura of Food Snob St. Louis recently started an etiquette business called Please & Thank You. Laura was trained in etiquette (and actually had us over for a multi-course etiquette dinner to teach us some lessons a few months ago...I learned a lot!) and is now using those skills to train corporations, girl scout troops, and anyone else in need of a reminder about how to cut your food and what to do when your napkin falls on the floor. If you're in the St. Louis area, check out her upcoming events--she has a children's table manners class coming up in November! 3. 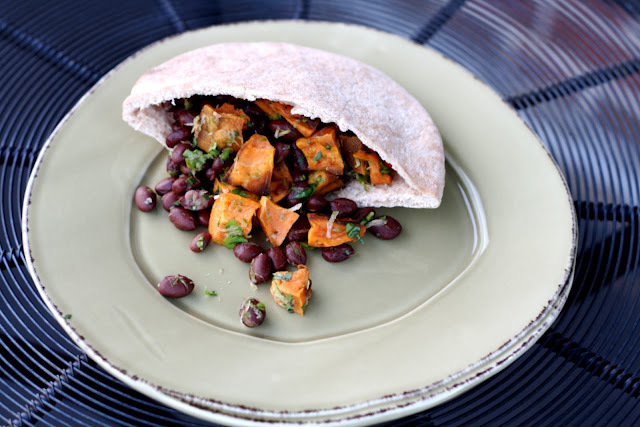 The Huffington Post recently featured my Cilantro Lime Black Bean Pitas in their black bean slideshow. Check out their other black bean recipes here (I want to make the stuffed poblanos!). 4. Last weekend I judged a pie baking contest for a nearby neighborhood festival (Dutchtown Harvest Festival). All pies had to contain were to contain a vegetable and we judged each pie on presentation (whole pie and slice), taste, texture, and creativity. Of the six pies we tasted, four were pumpkin (one of which was pumpkin cheesecake), one was sweet potato maple, and one brave contestant went the savory route with a quail egg, cheese, and mushroom pie. The pumpkin cheesecake took the coveted number one spot (and golden apron! ), but my personal favorite was the sweet potato maple! When it comes to fall pies, I've made a caramel pecan pie and a few different apple pies (like the caramel apple cheesecake pie), but never pumpkin or sweet potato! Sounds like I need to give them a try this year!